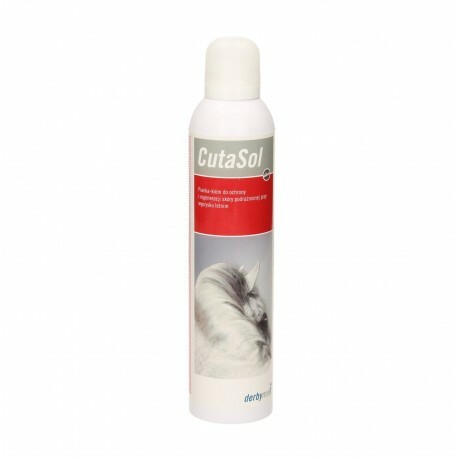 Cutasol soothes itching and irritated skin caused by sweet itch. This unique technology, with skin permeable lipids and urea, restores and regenerates the barrier function of the skin. It is easy to spread and helps to relieve the skin damage caused by sweet itch. Due to its unique texture, the patented foam allows an easy and accurate application on the skin. It builds up a breathable, two dimensional protection and promotes recovery of the skin barrier function. Skin permeable lipids absorb into the lipid layer of the dry skin, contribute to the restoration of damaged skin and promote a sustainable improvement of the skin’s barrier function. This helps to reduce itching and accelerates the healing process. Urea increases the water content in the thickened outer layer of dead skin, which softens and soothes, as well as having antibacterial properties. Allantoin protects against dehydration. Ingredients: Aqua, urea, decyl oleate, octyldodecanol, butane, panthenol, cetyl alcohol, glycerin, propane, stearic acid, glyceryl stearate, squalene, ceramide 3, allantoin,butyrospermum parkii butter, potassium lauroyl wheat amino acids, palm glycerides, sorbitol, caprylic/capric triglyceride, hydrogenated lecithin, sodium lauroyl sarcosinate, capryloylglycine, pentylene glycol.